Punkte Benötigt: 7350 Por favor, añade este título a tu Lista de deseos e Inicia sesión con tu cuenta My FedEx Rewards desde un dispositivo compatible. NOTICE: Activation key must be used on a valid Steam account. Requires an internet connection. About the game	All-Star Fruit Racing is the kart racing game you’ve been waiting for! Graphically stunning and incredible fun with a strategic twist that will keep you playing.Race on many breath-taking and distinct tracks spread over 5 spectacular islands: you’ll discover fantastic worlds... and re… member: speed is nothing without strategy!Key features Single-player and Multiplayer Modes Supports 2, 3, and 4-players in local split-screen Online multiplayer for up to 8 players (ranking included!) *Autumn A roster of 22 characters to unlock 5 islands composed of 21 tracks that will be polished with the help of the community 3 different karts customisable with over 40.000 possible combinations to unlock 5 Gameplay modes (Random Juicer, Juicer, Dragster, Elimination and Elimination Mix) 5 Racing formats (Custom Race, Career, Fast Championship, Custom Championship and Time Attack) 40 different fun skills to master and use against your rivals Tons of items to unlockTHE JUICER:	Together with the incredible artwork the hook of All-Star Fruit Racing is the strategic element when using The Juicer. 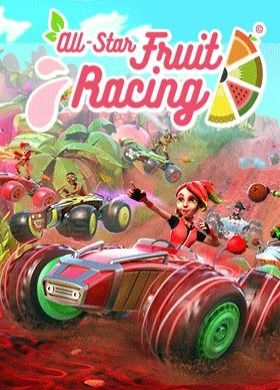 “The Juicer” is a liquidiser positioned on the back of each kart that contains four separate tanks to be filled by collecting fruit on the track. Once you have filled a tank you can unleash a power up, if you have two or more tanks full then you can choose to use a combo power up, the more tanks you fill the stronger the combo move, wait until all four tanks are full and you can throw a “Mega-Juice” power up. Each pilot has its own unique “Mega-Juice” power up which if used right can turn a race on its head! system requirements Windows - Minimum Requires a 64-bit processor and operating system OS: 64 bit Windows 10 / 8 / 7 Processor: Intel Core i5-2500K 3.3GHz / AMD FX-8150 3.6GHz or equivalent Memory: 4 GB RAM Graphics: GeForce GTX 550 Ti / Radeon HD 6790 2GB VRAM* DirectX: Version 11 Network: Broadband Internet connection Storage: 4 GB available space Sound Card: DirectX compatible soundcard Additional Notes: * Laptop versions of graphics cards may work but are not officially supported. Steering wheels not supported.Windows - Recommended Requires a 64-bit processor and operating system OS: 64 bit Windows 10 / 8 / 7 Processor: Intel Core i5-4460 3.2 GHz / AMD Ryzen 5 1600X 3.6GHz Memory: 8 GB RAM Graphics: GeForce GTX 960 / Radeon HD 7950 3GB VRAM* DirectX: Version 11 Network: Broadband Internet connection Storage: 4 GB available space Sound Card: DirectX compatible soundcard Additional Notes: * Laptop versions of graphics cards may work but are not officially supported. Steering wheels not supported. © 3DClouds.it - a division of FORMEX SRL. All rights reserved. Published by PQube Limited.